Math concepts can be confusing for young kids to master, and they can easily become a chore full of frustration for early learners. Luckily there are a lot of ways to spice up your math practice and make learning math concepts fun! Every holiday has it’s signature candy and for Valentine’s Day that candy is- Conversation Hearts! 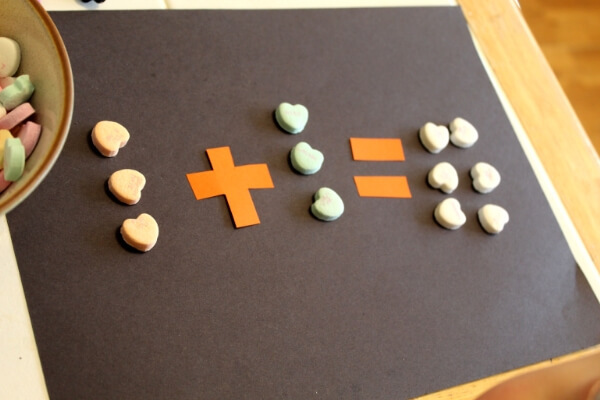 So let’s do some Valentine’s day themed math using this fun confection! 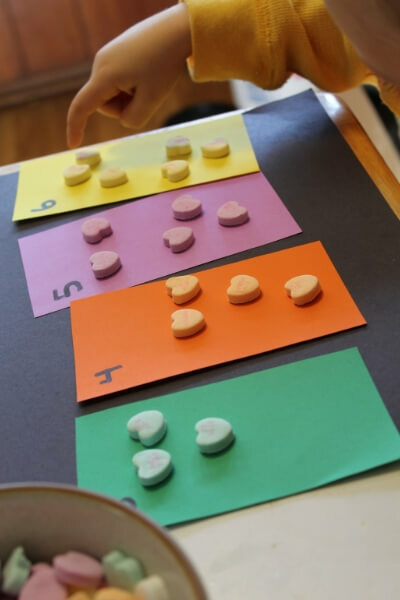 Below are 7 ways you can use candy hearts to get your kids excited about practicing math! 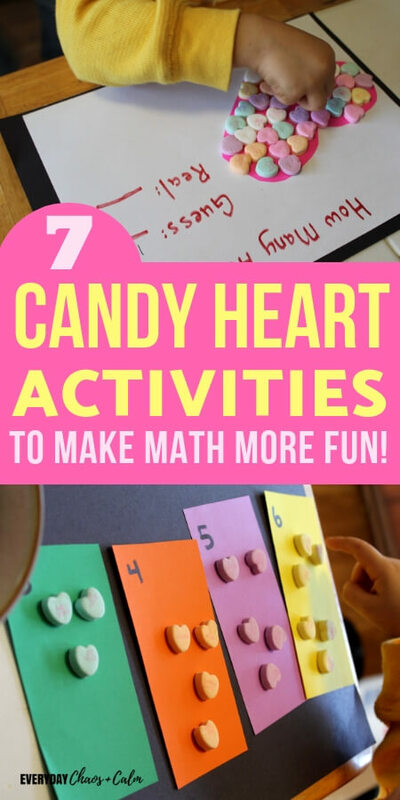 7 Candy Hearth Activities for Kids to Make Math More Fun! Let’s start with some candy heart math activities for the younger crew. These first are great for older toddlers, but the rest are for preschool to kindergarten aged kids. Of course younger kids are always welcome to play along! 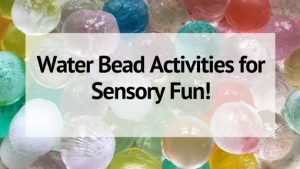 And most activities can be tailored for older kids as well. 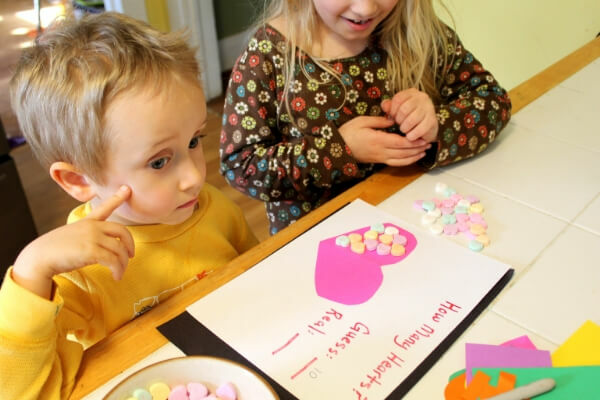 For the youngest learners, sorting candy hearts by color is the easiest place to start. 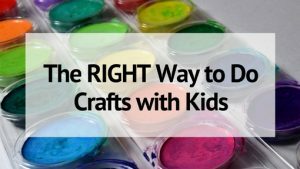 You can give them a color coded plate, bowl, or piece of paper and let them match the color of the heart to the color of the container. You can also just have them make piles of different colors. Older kids can enjoy this activity by sorting by the phrase on the heart instead- a great way to mix reading and math! My kids always had trouble with patterns. I don’t know why but it was pretty confusing- but doing fun activities like creating patterns using conversation hearts makes things a lot less frustrating! 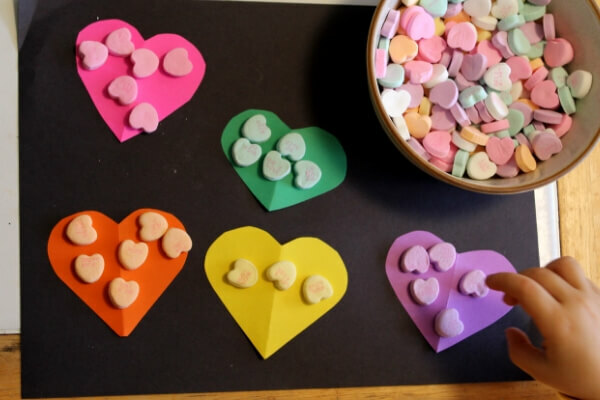 You can do this activity a number of ways, but an easy, no-prep way to start is to hand out a pile of candy hearts and start a patterns yourself with them then allow your child to continue the pattern on. Younger kids can start with simple 2 color patterns- purple, white, purple, white….etc. Older kids can do more advance patterns- yellow, green, green, purple, yellow, green, green, purple…etc. There’s no limit to the patterns you can make. Maybe you could challenge your oldest kids to see who can make the most complicated patterns. Many kids can grasp counting at a fairly early age, but counting with one to one correspondence is a lot more challenging of a concept. Having your kids practice counting objects instead of just counting aloud is an important developmental step. You can count just about anything- so why not candy hearts? An easy, self directed activity is to give them a card or paper with a number on it and allow them to count out that many hearts and place them on the card. Younger kids may need the aid of the correct number of boxes to begin, but soon should be able to count out the correct amount with no trouble! 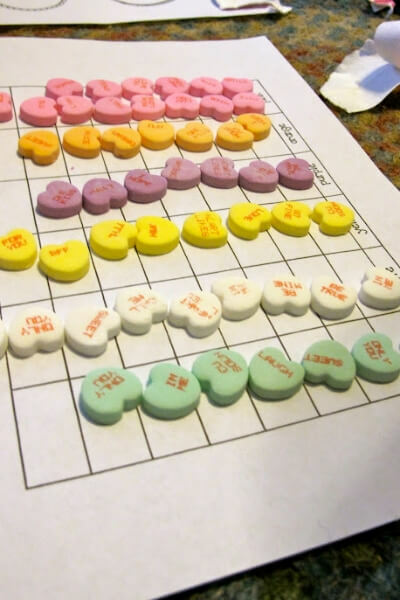 Candy hearts are fun way to reinforce graphing skills for kids. To start decide what you will graph– how many of each color is in the bag? Favorite colors in the group/family? Or all of them? Then it’s time to graph! If you need one you can grab a printable Candy Heart Graph paper to place your hearts on. How many more purple hearts than white hearts are there? Which color is there the most of? Which color is there the least of? How can you measure with candy hearts? 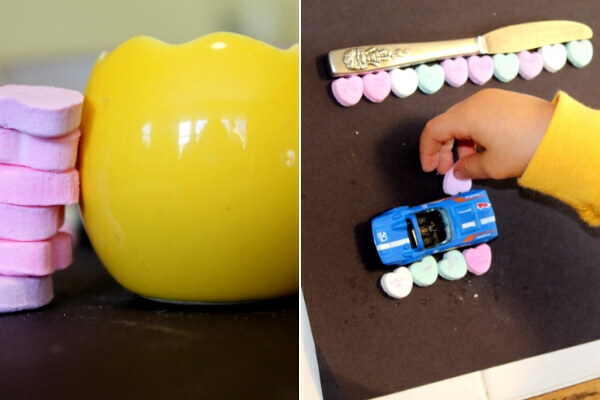 Well- before you get to inches, feet, centimeters, and meters, kids learn to measure in non-standard measurements– and that’s where candy hearts come in! Grab a few objects in various sizes- books, pencils, paper, toys, etc- and lay them out of your table. Then grab your hearts. Ask you child to estimate how long an object is. ie. How many hearts long is this book? Then let them lay hearts side by side from one end of the object to the other and see how close their guess was! Ahh– now for the dreaded math facts 😉 Learning to add and subtract doesn’t have to be painful. And it doesn’t have to be dry. 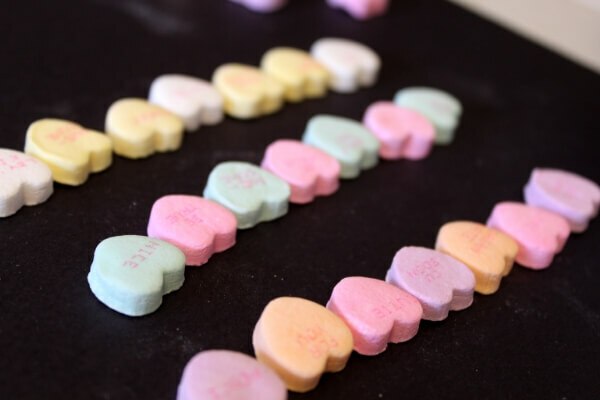 Get a head start on learning how to add and subtract by using candy hearts to have a little fun. 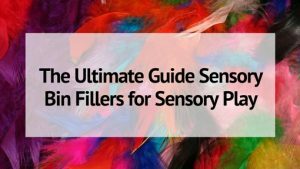 You can get fancy and print out cards use for adding and subtract, or you can just make it a fun, no stress activity where you get to spend some quality learning time with your kids. If you have 2 hearts and I have 3, how many do we have together? If I have 6 hearts and I eat 3 of them, how many do I have left? If there are 4 green hearts and 1 purple heart, how many more green hearts are there? These questions help your child not only learn addition and subtraction facts but help with their reasoning skills. I have fond memories of holiday parties back in school where we had to guess how many candies were in a jar and if we were the closest we won the jar- it was a favorite for the whole class! 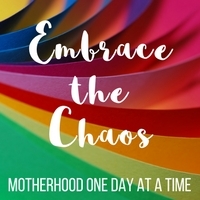 You can do the same kind of activities with your kids at home. It doesn’t have to be a whole jar of candy either. Maybe estimate how many you can hold in your hand. Or draw a large heart on a piece of paper and have your child estimate how many can fit inside- and then fill it to see how close they get. This will help your child develop accuracy and be able to tell at a glance the reasonableness of their answer. This will help them in later math when deciding if a guess is a reasonable answer to a problem, help with judging time or distance estimation, and so forth.